Promenade des AnglaisOld Nice (Vieux Nice) is a bustling mass of winding lanes full of little boutiques, patissieres, restaurants and touristy knickknacks - all within a compact area bound by the Cours Saleya on one side and the Albert 1st Gardens on the other. Wander the lanes and soak up the atmosphere, stop for a coffee or sample the traditional Nicois dishes at one of the many eateries. The air is perfumed with the smell of provencal lavender sachets and scented soaps. 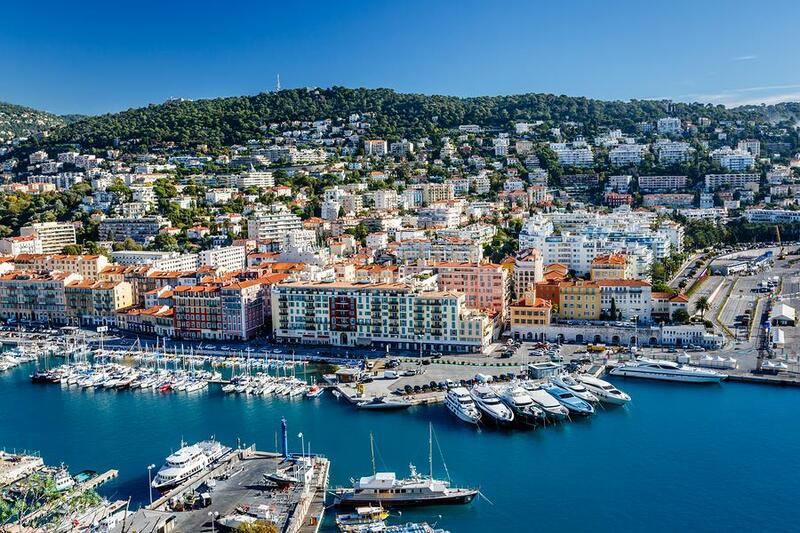 The sun, the sea and the relaxed atmosphere are highlights of Nice and a leisurely walk along the Promenade des Anglais,"The Promenade of the English", is a must. 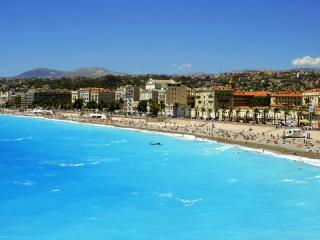 On the way admire the belle epoque hotels and apartments, or just drink in the azure blue sea and sky. Built in 1820 by an Englishman, Lewis Way, for afternoon strolls - today the palm tree lined promenade is used by walkers, joggers, cyclists and roller bladers. 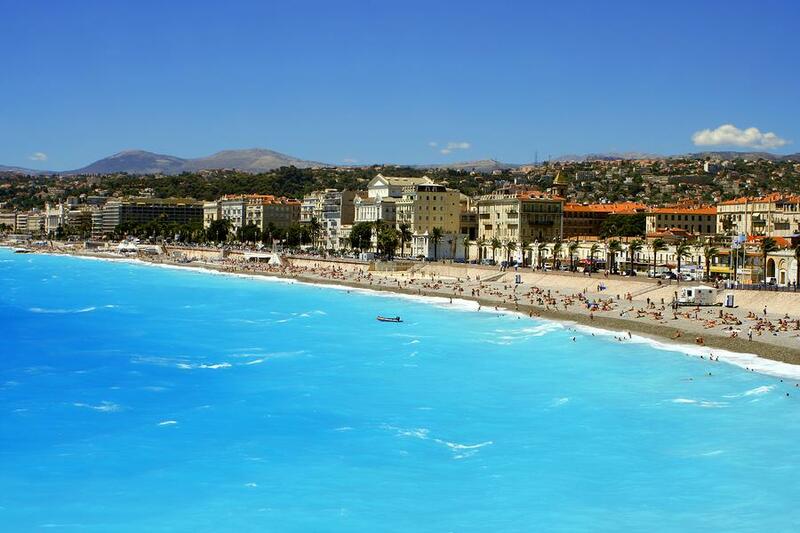 The promenade runs the length of Nice's beach front. 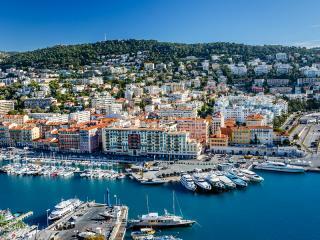 For a relatively small city, Nice has a surprising number of very good museums. The Musée d'Art Moderne et d'Art Contemporain is Nice's pride and joy in the architectural stakes. Glass walkways connect the four marble-coated towers, on top of which is a must-see rooftop garden. A major permanent collection traces the history of the European and American avant-garde since the early sixties. Attracted by the weather, the scenery and the proximity of his friends (Picasso, Renoir and Bonnard lived in neighbouring towns), Henri Matisse wintered in Nice until his death in Cimiez in 1954. If you like the works of Matisse, then don´t miss the excellent Musée Matisse. It houses many of his paintings, sketches, sculptures and pottery in addition to some of the original furniture and other objects that show up in his paintings. The Musée National Message Biblique Marc Chagall houses the largest public collection of works by the Belarusian painter Marc Chagall (1887-1985). The museum was built in 1972 to hold the Biblical Message Cycle, a collection of 17 enormous canvases inspired by the Old Testament. Chagall's style is nothing short of magical - including imagery of brightly coloured goats, violins and floating humans. The Cathédrale Orthodoxe Russe St-Nicolas signifies the long established Russian presence on the Riviera at the end of the 19th century. Built by Tsar Nicolas in 1912, the Cathedral contains superb treasures of icons, woodwork, and frescos. The church was the first to be designated a Russian Orthodox Cathedral outside Russia. With its six onion domes and mix of grey marble, brightly coloured ceramic and red brick, the effect is quite exotic. The cathedral is in a park setting, north of the train station. Visitors should dress appropriately - no shorts, sleeveless shirts or miniskirts. The Parc du Château is a shady public park where local families come to stroll and admire the panoramic views of Nice and the sparkling Baie des Anges. It's a great place to beat the heat on a summer afternoon, and sometimes there are open-air concerts as entertainment. To get to the top of the chateau, take the (lift) from under the Tour Bellanda. The Chemins de Fer de la Provence runs one of France's most scenic rail routes from the gare de Provence on Nice's rue Alfred Binet. The two-car diesel trains run up the valley of the Var between Nice and Digne-les-Bains, climbing through some spectacular scenery as it goes. Four trains run daily, year-round, and the whole journey takes three hours and fifteen minutes.